Imagine the Gulf Coast is your body. Now imagine all that toxic oil is the junk food we digest every day. We don't want to damage the earth's fragile ecosystem and we certainly don't want to harm our body's ecosystem. But that is what we have been doing to ourselves and are still doing to ourselves -- poisoning our bodies a little bit at a time with all that overly processed junk food. And it is killing us, slowly killing us. 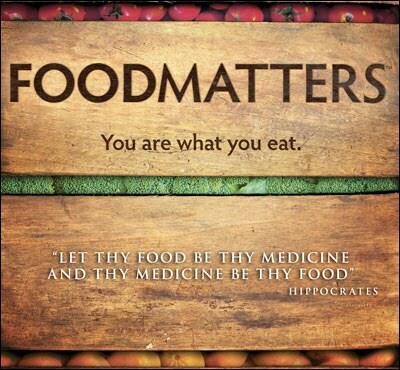 That is the message of the documentary "Food Matters," which screened at the Awareness Film Festival in Los Angeles this past Friday. In my view it is perhaps one of the most important films to watch this year because we have an epidemic of diabetes, heart disease and cancer in this country and we are losing the war. And why are we losing the war? Because we have ignored nutrition, holistic diet, exercise, vitamins, detoxification and other natural remedies in favor of pharmaceutical drugs, expensive technology and costly invasive medical treatments. One of the most moving and striking segments of the film is the topic of preventing and healing cancer. It is such a sensitive subject because it leaves virtually no one untouched. We have all had close friends or family members suffer and die from this dreaded disease. But despite evidence to the contrary, the medical establishment will not consider nutrition and vitamins as a treatment to cure cancer. One doctor in the film treats his patients with an IV line of up to 2,000 mg of Vitamin C and many of his patients have gone into remission and have been completely cured of their cancer. And all of this without putting radiation into their bodies through chemotherapy. But this doctor is forced to practice medicine in Mexico instead of San Diego because nutrition-based treatments are currently illegal in the United States. "I was in acute liver failure about eight months ago and so my diet really changed," said Awareness fest director Skye Kelly. "It inspired me to watch this movie and realize the toxic stuff that you put in your system all the time with all the food that's out there. This gets into the heart of the nutritive things that you can do to heal yourself. It's something really powerful. It's one of those films where people walk out changed and view everything that they do differently."